Azadi tower (or Borj-e-Azadi), formerly known as Shahyad tower, is a current era monument built during the second Pahlavi reign. This tower has since become the main icon of capital city Tehran and remained so even after the Milad tower was built in 2009. Following queen Farah Pahlavi’s decision, this tower was designed and built by Hossein Amanat in 1971 in commemoration of the 2,500th anniversary of the Persian Empire. The architecture of Azadi, combines elements of the ancient Persian architecture of Sassanid and Achaemenid eras, and Post-Islamic Iranian architecture (specially Sheikh Lotfollah mosque). Today, different sections of this tower are used for various cultural and artistic purposes. I like this tower for its unique architecture. I have always tried to choose subjects that are symbolic, so that I may project their greatness through photography; The Azadi Tower is a perfect example. 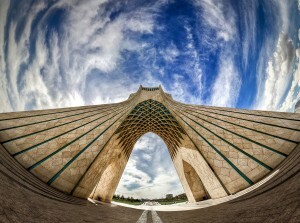 In this instance I used a fisheye lens to give the tower a unique effect, the presence of the clouds also helped.